Eddie Murphy Goes From Talking Donkey To Talking Kung Fu Dog!!! LOS ANGELES, CA, AUGUST 10, 2011—Eddie Murphy will give voice to the animated lead character in Alcon Entertainment’s live action/animated big screen adaptation of the of the 1970s Hanna-Barbera animated TV series HONG KONG PHOOEY, it was announced by Alcon co-founders and co-CEO’s Broderick Johnson and Andrew Kosove. In addition to voicing the character of Donkey in the box-office hit “Shrek” franchise, Murphy was also the voice of Mushu, the Dragon, in the successful animated epic “Mulan.” Murphy will next be seen in the comedies “Tower Heist,” co-starring Ben Stiller from Universal Studios and “A Thousand Words,” from DreamWorks. 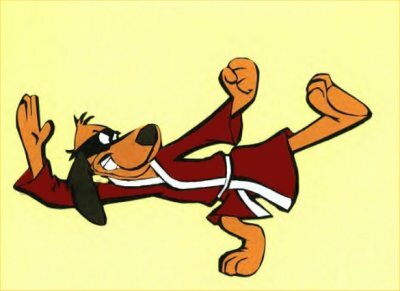 Based on the 70’s cult classic Hanna Barbera animated TV series, a mild-mannered dog named PENRY (Murphy) stumbles into a mystic ceremony and is accidentally granted mystic powers, including the ability to walk, talk, and do kung fu. Under the tutelage of his kung fu master, Penry dons a costume and becomes Hong Kong Phooey, and with the help of his trusting sidekick Spot the cat cleans up a rogues gallery of wacky criminals. Murphy is represented by Adam Venit at WME, and Skip Brittenham and Matt Johnson at Ziffren Brittenham. Alcon’s in house counsel David Fierson negotiated on behalf of the Company. This entry was posted on Wednesday, August 10th, 2011 at 4:24 pm	and is filed under Film, News. You can follow any responses to this entry through the RSS 2.0 feed. You can skip to the end and leave a response. Pinging is currently not allowed. « Watch Cartoon Network’s ‘Black Dynamite’ Pilot Episode!! !